I just bought some new stamps from the Post Office the other day. As I usually do, I bought ones in the “pane” format, where the stamps grouped together create a larger picture and the text on the back contains educational material about the picture. (My feeling is that if you have the choice, why not go for the more interesting option?) In this case, the “Hawaiian Rain Forest” pane, the front depicts a beautiful Hawaiian rainforest with birds and other wildlife roaming in it - apparently 24 separate species in all. 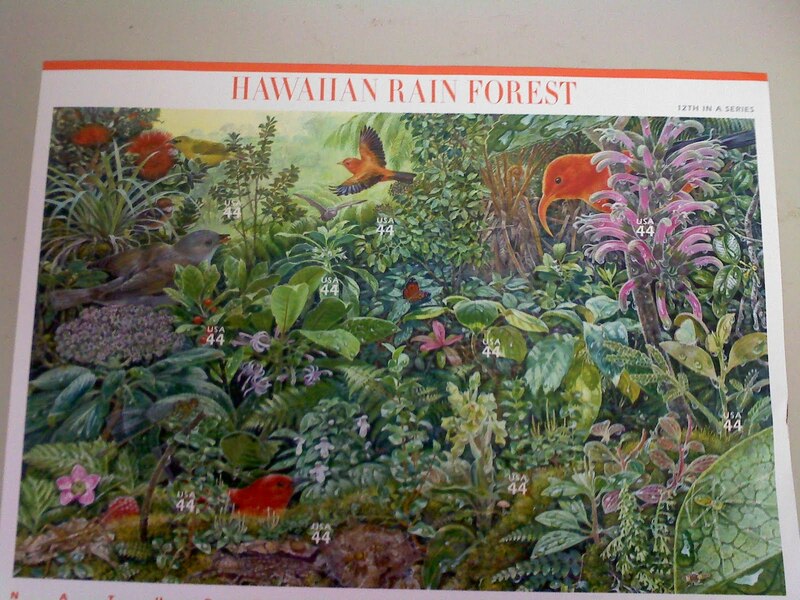 The text on the back discusses Hawaiian rain forests and identifies each of the species depicted. Number 16 is identified as “ ‘Ilihia (African Violet Family) Cyrtandra platyphylla”! Indeed, one of the stamps depicts a Cyrtandra with a butterfly nearby. According to the Post Office, the stamp pane is part of an educational series focusing on the beauty and complexity of major plant and animal communities in the United States. The Post Office also explains that though the scene depicted is imaginary, “every species depicted could be encountered in a Hawaiian rain forest, and all of the species and their interactions are appropriate and were recommended by scientists.” Each pane contains 10 44 cent stamps. The artwork is also available on stamped postcards ($8.95 for a pack of 10) and if you don’t have a Post Office near you, both the panes and the postcards can be purchased online at www.usps.com. The Smithsonian's National Museum of Natural History has a section of their website dedicated to the Flora of the Hawaiian Islands, including a checklist with this page on Cyrtandra platyphylla.